After sitting for 8-9 hours straight at your desk, you may tend to slouch unknowingly to get a bit comfy? After having a hectic day at work, isn’t lounging on the couch and watching TV the most relaxing activity ever? Wonder why we’re pointing these little things out of the blue? Well, these are some of the posture mistakes that we are all guilty of committing, knowingly or unknowingly. 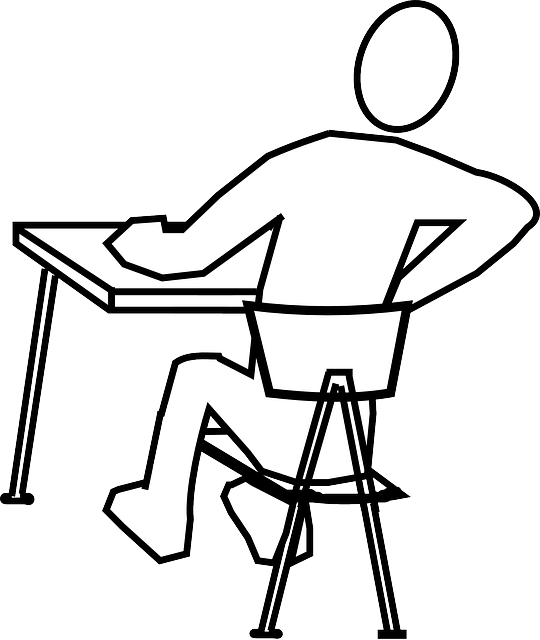 Apart from changing the way we sit and stand, poor posture can lead to back problems. Poor posture might not always be the cause of those terrible back aches that keep you up all night, but it sure does enhance the muscle tension and makes it harder to recover. In this post, we’ll discuss some common posture mistakes that can cause your back problems. Slumping doesn’t always cause severe discomfort or pain in the back but is considered to be the primary reason for poor posture over time. Slouching for extended periods of time puts a great deal of stress on our upper backs and neck, especially if it is not supported properly. It strains the sensitive tissues and muscles in our back, leading to back problems. One must adapt a healthy sitting posture and avoid slumping for long hours as it may damage the muscle tissues over time. In addition to that, this inaccurate sitting position may also lead to changes in the spine and by increasing or decreasing certain curves from their natural structure. Apart from correcting your sitting posture, you can also start with exercises to strengthen your buttock and core muscles as well as physiotherapy or chiropractic treatment for lower back pain. Some people tend to stick out their bottoms while they stand. High heels, pregnancy and an expanding waist line are some of the primary causes that can create an increased curve in our lower backs. If the curve in your lower back becomes more noticeable over time, it can be a sign of hyperlordosis and back pain is one of the most obvious results of this condition. Similarly, standing with a flat back can also disturb the natural curvature of our spine and cause stress in the lower back muscles. This posture also forces us to lean our neck and head forward, which puts more strain on our upper back too. 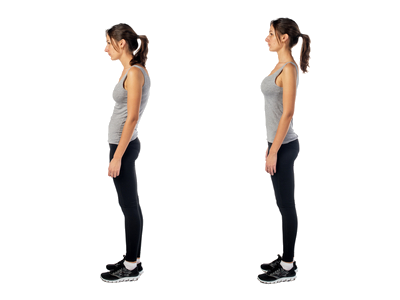 An incorrect standing position can be corrected by regular exercise. Try planks and side-lying leg raises to increase strength and hamstring and hip flexor stretches to stop muscular tension around the pelvis. Leaning on one leg is quite common when you are standing for long periods of time and it can feel so much more comfortable. But, if standing for extended hours is a part of your job and you’re putting more weight on one leg, chances are it might have already affected your posture or even contributed to your back pain. While leaning on one leg, instead of using our buttocks and core muscle to stay upright, we put all the body weight on one leg, causing excessive pressure on the joints on one side of the lower back and hip. Over time, it leads to muscle imbalance around the pelvis region leading to an aching lower back. You must make it a habit to stand upright with your weight evenly distributed on both legs to prevent any back aches in the future. If you are already suffering from a sore back, start changing the way you stand now! Hunching over the keyboard, while working or using your phone and looking down can significantly change the curve in your neck leading to more pain on the base of your neck as well as weakening the upper back over time. This position causes you to develop rounded shoulders because your muscles and joints can’t support your body like they should and can also result in stiffness around the shoulders as well as in the upper back. Pain in the upper back is a common problem among people who have jobs which require extended periods of sitting or people who are always on their phones. Regular upper back, shoulder and neck strengthening exercises are recommended to prevent neck and upper back pain. Sleeping on your stomach is the worst way you can sleep and can lead to significant posture changes and back pain. While you are continuously sleeping on your stomach, the joints in your back significantly compress and the natural curve of your lower back is altered. This increased curve causes your pelvis to tilt forward that lead to further muscular imbalances causing lower back pain. Try to avoid sleeping on your stomach and instead sleep on your sides as this helps keeps your body in a relaxed state without affecting the structure of your spine. High-heels are every girl’s best friend. But the irony is it might as well be your worst enemy. High heels transfer the entire weight of your body on the toe that leads to an anterior shift of the weight. Wearing high heels strains the thigh and hip flexors, resulting in the increased curvature of the spine, causing back pain. This condition can be avoided by wearing flat sole shoes that help in even distribution of the weight and also prevents any imbalance and reduces stress on the hips and lower back while walking. Many people face various back problems that start with bad posture and can’t be fixed completely without changing your daily lifestyle. Make sure you’re paying attention to your posture and making the necessary changes to your lifestyle in order to correct it and always seek professional advice if you’re experiencing back problems or need advice. This Concludes: Frequent Posture Mistakes That Leads To Back Problems. What Did You Think Of This Post? Let Us Know By Rating Below! Janice Cook is a famous dietician and orthopedic expert based in the United Kingdom and is known for her treatment of lower back pain. She is also a part time blogger and loves to write on various health related topics.